A tribute to TWO of the most Iconic Pop/Rock bands. SIMPLE MINDS and DEACON BLUE. Tickets in advance 10 pound. Printed Tickets also at outlets !! Simple Minded are a Scottish Tribute Band to Simple Minds that have featured yearly at Dreadnoughtrock since 2013 to sell out audience levels. It's always a pleasure to welcome them back to Scotlands Longest Running Rock Club and West Lothian's Premier Rock Venue for a sensational set. Simple Minded's aim is to capture the sound and energy that Simple Minds produced during the 'New Gold Dream' and 'Tour du Monde' tours. They do that and more with a set list that features some forgotten gems to the Chart topping hits of old. This year is slightly different as it's going to be a double tribute night as we welcome the debut to Dreadnoughtrock of Deacon Blues who are the only Deacon Blue tribute band currently touring and performing in the UK. Also Hailing from Scotland, they will be playing the songs of Deacon Blue and it's a pleasure to bring one of Scotland's most Iconic Pop Rock Bands to Dreadnoughtrock. 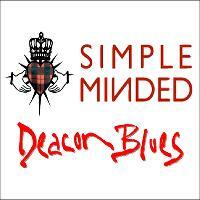 For the first time we want to bring the music of Deacon Blue to the fans in intimate venues. They will work the back catalogue and incorporate fan's favourite with some rarities. Make no mistake this will be a cracking night of Live Music not to be missed with us and expect it to be in high demand so please ensure you buy an advance ticket for this one online or thro one of our outlets who will be selling Printed tickets from the end of July 2018. Printed Tickets will be available at Mid Street Barbers and Kilt Studio in Bathgate along with West Lothian Guitar Services in Livingston as well as our own Paybooth. Approx Stage Time - 8.15-11pm with an interlude between tribute acts. YOUR TICKET also includes entry to stay on till 3am either in the Lower area or Rock the night away till 3am with us in the Rock Club that's been going 46 years.